Blended with pure safflower oil, our Vitamin E oils are created for your specific need. The higher concentrations are thicker with more medicinal benefits; the lower concentrations make excellent moisturizers and effective lubricants. Helps moisturize & soften dry, rough, skin. May help reduce the appearance of fine lines & wrinkles. Kit can be carried everywhere easily. Tuck an extra bottle in your purse or glove compartment for emergencies. It's an effective aid for cuts, scrapes and insect bites as well as athlete's foot, nail fungus and acne. Apply to clean dry skin. 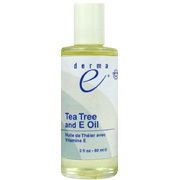 Tea Tree & Vit E Oil is shipped in a discrete, unmarked package. Orders are processed immediately and usually take about 3 to 5 working days to be received. We do ask that you try it for 2 to 3 weeks to feel the full effects. Any information received is used only for order processing and shipping purposes. Your information, such as e-mail address, will never be disclosed to a third party.